Has Unicorn come trotting across your mind's eye with glitter hoof and silky mane? Unicorn is special - a star in it's own right. As a mythical creature, it is connected to both the heavens and the earth. A creature of magic on the physical plane. Fantasy given flesh and bone. A beauty of both land and sky. 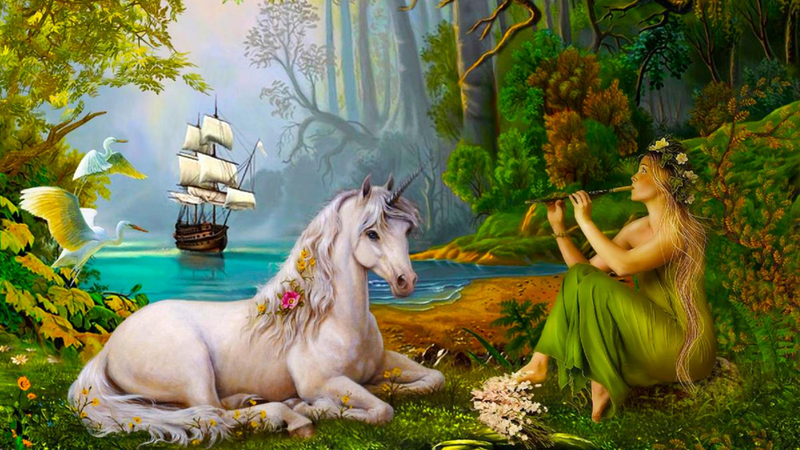 Here is what it may mean if you have Unicorn as a Spirit Animal. Shimmer and shake! Prance and dance! Be magical, mystical, and majestic. Make them stop and stare from the twinkling of your aura. You are something special! A body of light. Created from magick dust, glitter bombs, and angel feathers. Unicorn animal totem asks you to know this in your heart. Be confident in the magic of your own soul. Express it. The Unicorn is one of a kind. It accepts itself for who it is - sparkles, rainbow glitter, horn, and all. Each is unique and beautiful in it's own way. Unicorn asks you to release comparison and jealousy. See the elegant magic of your individuality. Don't be afraid to stand out in the crowd! Don't close out them realm of possibilities. Fantasize. Dream BIG! Embrace your purity and innocence. Unicorn invites you to play with your inner child. Allow them to run wild and laugh freely. See with new waking eyes that view the world with awe and adventure. Imagine. Open and meditate on your Crown Chakra. Journey. Reawaken your sense of discovery and expedition. Love Freely with an Open Heart and Mind! See the good in all living things. Feel the connectedness and wonder of everything. The wisdom of the cosmos. Share love and kindness wherever you go. Be empathic and understanding. The spirit of Unicorn encourages you to open, heal, balance, and strengthen your heart chakra. Greet everyone you encounter with love and light straight from the heart. Charge forward. Pierce through obstacles. The horn of the Unicorn does all these things. It leads the way and will navigate you to your true north. Believe in your own power. You are capable and worthy of all you dream. Even in the most challenging of circumstances, the love and support that Unicorn gives is undying. They are loyal to the end. Unicorn gives you strength to help pierce through challenges and clear a path to your goals. Do not give up hope - BELIEVE!